Gold Flake homes for sale are custom-built on large lots, very close to, but not in, downtown. They’re on Breck’s terrace. Aptly, Gold Flake Terrace is the name of a road that runs through the subdivision, which rests on the first hill east of the historic district. 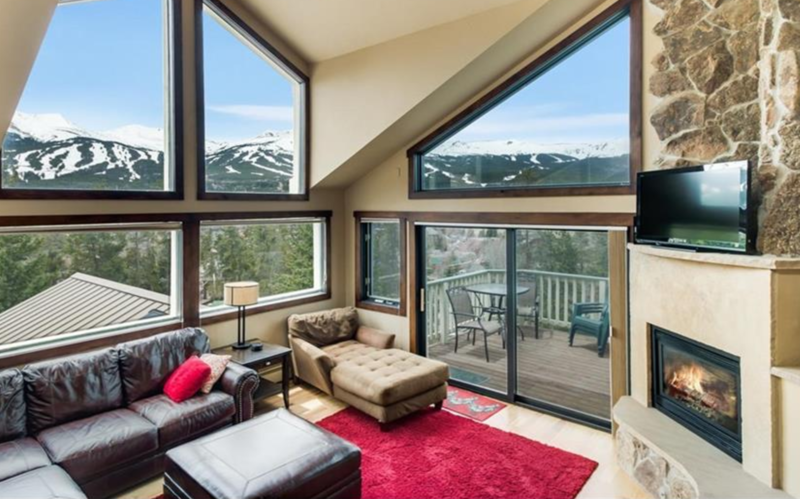 From any home for sale in Gold Flake the views west to the Tenmile Range are unimpeded and often panoramic. Many of the homes have west-facing decks because Gold Flake gets long, afternoon sun. Summer or winter, the walk down to town is easy via neighborhood trails and is only 10 minutes, although a little more strenuous going home. Directly to the north, is another single-family neighborhood, the Weisshorn, and both neighborhoods get very little drive through traffic. Are you ready to read more about this beautiful subdivision? Or, you can discover up-to-date Gold Flake real estate listings now. 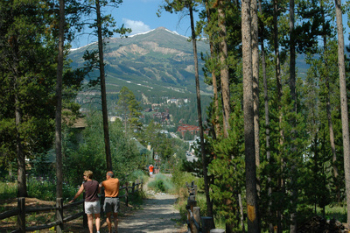 Gold Flake real estate sits just above downtown Breckenridge.The first claims to this land were for mining – gold – and thus the name of the subdivision. Later excavations began in the 1980s when five lots were developed between Lincoln and Washington streets on the first terrace above the historic residential streets. Gold Flake II was developed in the ’90s and spread the subdivision to the boundary with Carter Park, a town park with playgrounds, sledding hill and tennis courts. Peppered between these phases are extensions of the historic in-town subdivision called Yingling & Mickels Addition, but to any local this would be thought of as Gold Flake, as well. After 2000, Gold Flake III and Filing 3a were platted, and the neighborhood was extended to the east to the edge of Breckenridge Heights. Through the Breckenridge Open Space and Trails Commission, developers deeded land and easements that allowed the town to create forested walking paths through the neighborhood that lead from town, over open space to the national forest. Size (sq. ft. liv. area): 2666 sq. ft. to 8910 sq. ft. Amenities: Less than ½ mile and a 10-minute walk to town, yet up above it. Town trail system is easily accessed, and the views of the Tenmile Range are spectacular. The neighborhood roads are paved and the homes well maintained. Directly above the last historical street in Breckenridge, and south of Lincoln is the Gold Flake neighborhood. Drive east on Wellington Road about .5 mile from Main Street, and turn south (right) on either Pine or Gold Flake and you will find all of the Gold Flake homes in this loop. We would love to discuss the real estate opportunities in the Gold Flake subdivision, or any other neighborhood in Breckenridge and the surrounding area. Send us a message online or call us at (970) 453-2200.